Raisa Kislik was born in Leningrad, Russia (now St. Petersburg) in 1937. She began her violin studies at the age of 6 and attended classes at the Leningrad Conservatory taught by Irina Etiton. In 1960, she graduated with honors from the Leningrad Conservatory, where she studied for 5 years with violin professor Boris Sergeev. She was then placed by the Conservatory Administration in the Orchestra of the Musical Theater in Petrozavodsk (the Capital of the former Karelian Republic.) In 1961, she successfully auditioned for admission into the Moscow Musical Theater of Stanislavsky and Nemirovich-Danchenko, where she worked as an assistant violin leader and solo performer for 29 years. In 1991, she was transferred with a group of other members of Stanislavski and Nemirovich-Danchenko orchestra to the "New Opera" Musical Theater by Evgeny Kolobov, the CEO and conductor, where she worked and performed until she immigrated with her husband to Rochester in 2004. Raisa Kislik has performed in orchestras for many classical concerts, classical operas, ballets, and musical theater and has traveled for professional performances all around the world, including Europe, Israel, Japan and the USA. 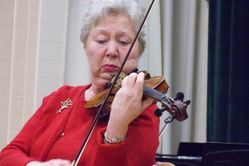 After immigrating in 2004 to America, she joined as a volunteer performer with the Brighton and Greece Symphony Orchestras because of her life-long love for classical music and playing the violin.